One of six global military commands within the United States Department of Defense unified command structure - each of which co-ordinates the activities of the country’s hundreds of military bases - U.S. Africa Command [AFRICOM] splits the 50 plus countries of the African continent into 5 regions. 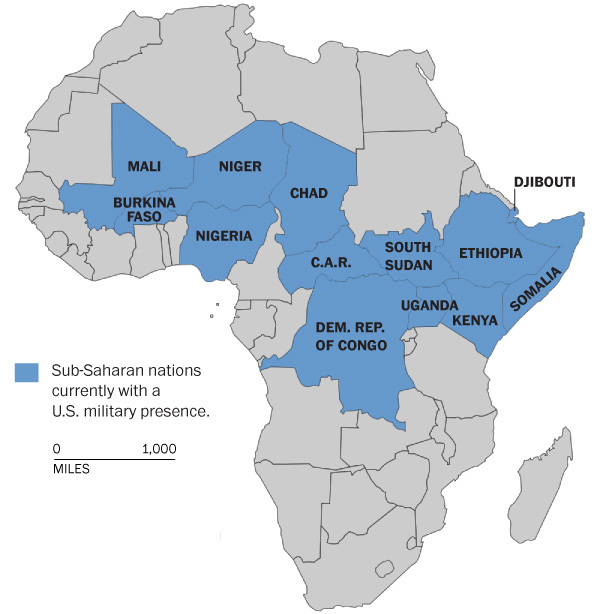 Each one - East, North, West, Central and Southern is declared to be an area of [self-proclaimed] responsibility [including Egypt] and is how AFRICOM facilitates political interference, military intervention and exploitation of the continent’s natural resources on behalf of US monopoly interests. Billions of dollars are estimated to have been invested to build bases, arm allies, gather intelligence, conduct proxy wars, carry out drone attacks [usually for targeted assassinations], and pursue military missions estimated to be in the thousands. In this respect credible accounts report that the United States reached an “implementing arrangement” in May 2014 with Djibouti “that secures [its] presence” in that country “through 2044” [based at Camp Lemonnier.] Additionally, AFRICOM publicity openly alludes to the possibility of building a string of surveillance camps stretching along Africa’s northern tier. Along with these projects, and since Barack Obama’s presidency began in 2009, the United States military has established staging areas, mini-bases, and airfields in Senegal, Mali, Burkina Faso, Niger, the Central African Republic, South Sudan, Uganda, Kenya, and Ethiopia and - reportedly Chad (where AFRICOM is said to have built facilities for a special operations exercise). Such reports are given credence by accounts of a meeting in January 2015 where representatives from the United States and 12 allied states convened at MacDill Air Force Base in Tampa, Florida for the Silent Quest 15-1 military exercise. The war game - the latest in a series conducted since March 2013 - to navigate special operations interventions in Africa between now and 2025 - focused on the rise of the fictitious “Islamic State of Africa” over parts of Nigeria, Niger, and Cameroon. According to figures released by AFRICOM in it’s “posture statement,” the US military conducted 68 operations in 2014, up from 55 the previous year. [Alternative reports calculate that the United States carried out 674 military activities [annual operations, exercises, and military-to-military training events] across Africa, since US Africa Command (AFRICOM) was established in 2008. These included operations Juniper Micron and Echo Casemate, collaborating with French and African interventions in Mali and the Central African Republic; Observant Compass in central Africa [ostensibly against the Lord’s Resistance Army]; and United Assistance, where military personnel were deployed to combat the Ebola situation in West Africa. With headquarters in Stuttgart, Germany and commanded by General David M. Rodriguez since 2013, U.S. Africa Command oversees a multifaceted web of  military exercises,  a [United States] National Guard Partnership Programme, and what are described as  Security Cooperation Programmes and other  Operations. The objective of these ongoing projects is presented as a means to develop “capable, professional partner military forces”, and are integrated into and coordinated with the U.S. Department of State, their Chiefs of Diplomatic Missions, and with international partners. Each of the four activities are outlined in the AFRICOM website and it’s “What We Do” link. Tech savvy with links to most social media platforms, a glossy website translated to English, Arabic, French and Portuguese and declaring it’s aims as being to “deter and defeat transnational threats, prevent future conflicts, support humanitarian and disaster relief, and to protect US security interests” is how the U.S. Department of Defense Africa Command promotes the interventionist aims of the US Government. Increasing from 10 in 2013 to its current 15 joint military exercises, conducted with partner militaries and described as examples of “professionalism and U.S. core national values”, with AFRICOM - portrayed as trainers - is said to: “encourage the development of security capabilities” and entrenching of “a professional ethos among African military elements”. More than 1,700 multi-national military personnel led by U.S. [AFRICOM] are expected to participate in Exercise Flintlock scheduled to start February 08 2016 and continue until the end of the month. Special forces from Algeria, Burkina Faso, Chad, Mali, Mauritania, Morocco, Niger, Nigeria, Senegal, South Africa, Canada, Tunisia, Italy, France, Germany, the Netherlands, Spain, United Kingdom, and the United States have taken part in previous Flintlock exercises. Other exercises [see below] included African Lion in Morocco, Western Accord in Senegal, Central Accord in Cameroon, and Southern Accord in Malawi. AFRICOM also conducted maritime security exercises including Obangame Express in the Gulf of Guinea, Saharan Express in the waters off Senegal, and three weeks of maritime security training scenarios as part of Phoenix Express 2014, with sailors from several countries including Algeria, Italy, Libya, Malta, Morocco, Tunisia, and Turkey. The National Guard State Partnership Program is defined as a key U.S. security cooperation tool to “enable cooperation across all aspects of international civil-military affairs and to encourage people-to-people ties at the state level”. The website reports the initiative as a means to “directly support Department of Defense objectives and theater campaign plans by building relationships that enhance global security, understanding and cooperation”. Security Cooperation Programmes are listed on the Africom website as follows. It is widely accepted however that, recently, the United States has engaged in several multinational military interventions in Africa. · training and funding of African proxies to engage groups such as Boko Haram as well as Somalia’s al-Shabab and Mali’s Ansar al-Dine. Given that Africa is the scene of intense economic and military rivalry for her resources, markets and labour between the countries who colonised the continent over centuries, and more recent competitors such as the United States and China, the consolidation of AFRICOM appears designed to counter the growing influence of the BRICS countries [Brazil, Russia, India, China and South Africa] especially China, all of whom are also contending to defend their own economic interests. In this sense AFRICOM, along with its parallel global military commands, devoted to political and military interference and intervention is a source of war not peace. Shaun Ajamu Hutchinson is a Caribbean/London based arts editor, writer and journalist for www.thenewblackmagazine.com.